On 7th July 2011 I saw a Toad-headed Agama on the Sabkha north of Jubail. At the time I thought this was an Arabian Toad-headed Agama, but AbdulRahman Al-Sirhan has pointed out to me this was a Spotted Toad-headed Agama due to its colouration, size and shape, transverse bars on the body and tail and the fact it was in Sabkha habitat rather than sandy habitat. AbdulRahman has co-authored and excellent paper on the two species of Toad-headed Agama in Kuwait referenced at the end of this post. I would like to thank AbdulRahman for pointing out my mistake and alerting me to the correct species. The Spotted Toad-headed Agama (Phrynocephalus maculatus), also called the Blacktail Toad-headed Agama, is a member of the Agamidae family, and has a body colour that is highly variable, but typically has distinct brown bars across the body and tail. It also tends to match the colour of its background and lizards found on pale coastal sands tend to be paler and less patterned than those on red, inland sands. The agamid lizards are also known as the chisel-teeth lizards due to the compressed, fused teeth being firmly attached to the upper jaw, unlike most other lizards which have loosely attached teeth. The head is short and broad, with a deep forehead and snub nose, and the flattened body is wide and strong and covered in rough skin with overlapping scales. The long, flattened tail is rounded at the base and has a black tip on the underside which, when raised, is used in visual signals. The spotted toad-headed agama is known from Iran, Iraq, Afghanistan, Pakistan, Turkmenistan, Syria, Oman, northern Saudi Arabia, Kuwait and the United Arab Emirates. The species inhabits harder sandy surfaces where it is often associated with coastal salt flats known as ‘sabkhas’ ad rocky islands. The Arabian Toad-headed Agama prefers sandy desert areas. 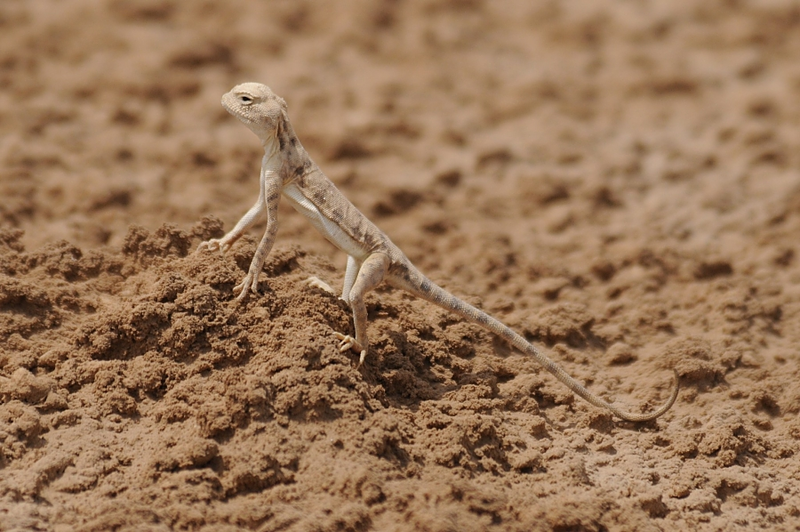 They are active in all but the hottest hours of the day looking for insect prey and during the hottest periods, they will stand high on extended legs to limit contact with the sand, balancing on fingertips and heels while using the tail as a prop. They are able to sink rapidly into the sand by vibrating the body in a process called ‘shimmy burial’, and it uses this behaviour to escape from predators or create a nocturnal shelter. They lay eggs, producing a clutch of one to seven which are incubated for around six to eight weeks in a burrow. Two species of Toad-headed Agama live in the region with Arabian Toad-headed Agama (P. arabicus) being the second species. The species are relatively easy to identify by the relatively longer tail compared to snout-vent length in P. maculatus of 130-160%, as opposed to 100-125% in P. arabicus. The two species can also be told apart by their shape, colour & number of scales present between the eye and lip. P. arabicus is short-bodied dark grey above with creamy white spots and the upper-side of the tail paler than the body and lacking the spots. The ventral body parts were white with the under-side of the tail orange from the vent to the dark tail band and the species has three to four scales between the eye and lip. P. maculatus is relatively slim and long-bodied and appears larger than P. arabicus and has five to six scales between the eye and lip. The upper-side of the body is sandy grey with five broad dark brown cross bars, with the bars continuing on the tail from vent to the end of the tail with a longer dark terminal tail band, about 20% of the tail length (Al Sirhan & Brown 2010). Very interesting Jem and a cracking picture. Do you get to photograph many butterflies? As you would expect I have only seen a few butterflies in the Eastern Province of Saudi Arabia and many are dependant on good rains (more flowers and gresses etc), which we did not get this year. I have a few photos of Clouded Yellow and Painted Lady which will be familiar you you from the UK, but not much else. These can be found along with a couple of other butterliesand moths under Wildlife and Nature Laels at the end of the blog in the right hand column.